Armored vehicles – tanks, armored cars and prime movers – proved harder to hide from the Axis Armistice commission than other support weapons, but the French garrison of North Africa still managed. Additional tanks were shipped to Tunisia from France with German permission, in the hopes that this would strengthen French resolve to resist Allied incursions. The motley collection present in Tunisia ranged from France’s best tank – the Somua S35 medium cavalry tank – through ancient armored cars. They saw some action when the Allies invaded French North Africa, but mostly went into action against the Axis once the French Army of Africa joined the anti-fascist resistance. 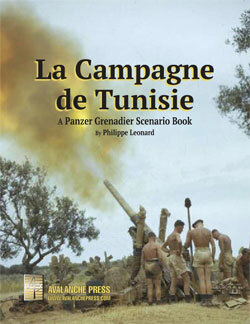 Those tanks, armored cars and such see action against the Germans and Italians (and, briefly, the Americans too) in Panzer Grenadier: La Campagne de Tunisie, an expansion for An Army at Dawn. Let’s take a look at them. France’s first modern tank, the Renault Char D1 was ordered in late 1930 as a replacement for the huge numbers of FT-17 light tanks still in service in the French Army (many of which would still be in use a decade later anyway). The new tank looked very modern, with sloped armor and a long, somewhat narrow hull. Initially topped with a tiny one-man turret, this would be replaced with a slightly larger model after the original was declared defective. The tank carried a 47mm gun and two machine guns, and for the time had good firepower and protection but was fairly slow. Every tank had a radio. The French Army took delivery of 150 vehicles, and used them extensively in training exercises. By 1938 they were considered obsolete; fifteen vehicles had been damaged or worn beyond repair through heavy use, while most of the others were considered badly worn. The remaining 135 tanks were shipped to Tunisia where they equipped three tank battalions (metropolitan rather than colonial units), and usually stationed in support of the Mareth Line fortifications confronting the Italian colony of Libya. The vehicles continued to deteriorate, and by the time war returned only 43 were considered fit for combat. Those were concentrated in the 67tth BCC and shipped to France, where they saw action supporting the 6th Colonial Infantry Division against the German 8th Panzer Division. The French tankers fought until all of their vehicles had either broken down or been destroyed. After the Armistice, the remaining tanks were divided between two cavalry regiments of the Tunisian garrison, as the Axis did not allow the French to retain armored units, with some of them hidden away from the Armistice commission. Those which had been repaired saw action against the Axis, including at the Battle of Kasserine Pass. After the fall of Tunis they were replaced, first by British-made Valentines and then American Shermans, and the handful of remaining D1 tanks were scrapped. The most numerous French tank of World War II, the Renault R35 was ordered in 1935, also intended to replace the aging FT-17. In this it succeeded to a much greater extent, with over 1,500 of them in service by 1939. The small tank had been intended as an infantry support vehicle, of similar concept to German assault guns, and as such it had only a limited capability against enemy armor with only a short-barreled 37mm gun and a single machine gun (with a second machine gun stored inside the tank that could be mounted on the outside of the turret for use against aircraft or ground targets). The two-man crew also hampered its effectiveness in armored combat. But it had never been intended to fight enemy tanks, and did have thick armor to resist anti-tank guns. It was very slow, but again, this mattered little in its intended role. When forced out of that role, as happened all too often, the little tank became easy prey for its opponents. 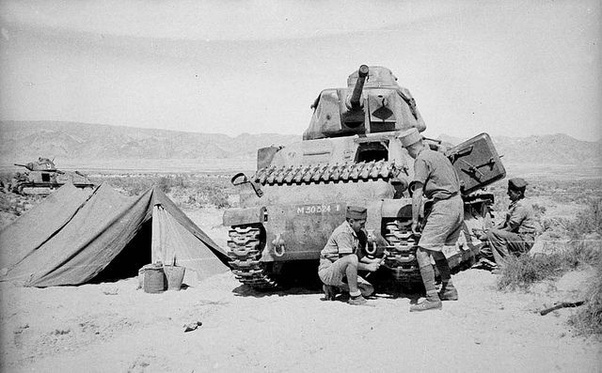 The 62nd BCC (Tank Battalion) had served in the Moroccan garrison since 1923 (as the 517th Tank Regiment, reorganizing in 1926) and equipped with 45 Renault FT 17 light tanks. In April 1940, 30 of those were replaced by R35 tanks, equipping two companies, with the 15 FT-17’s of the third company parceled out among city garrisons as “local defense platoons.” The tankers of 62nd BCC resisted the American landings in November 1942, with disastrous results. In November 1941 the Germans allowed the French to send armored reinforcements to West Africa, 23 Somua S35 cavalry tanks of the 12th Chasseurs d’Afrique. The S35 was easily the best tank in the French inventory with a good mix of protection, firepower and speed. The S35’s 47mm SA35 main gun gave good performance against enemy armor. The well-designed suspension and gearbox – created by the same engineer who had crafted those assemblies for the Skoda LT35 and LT38 – allowed much greater use without maintenance, and the cast armor (the first such mass-produced tank in the world) gave excellent protection for its weight. Unlike most other tanks of the time, the S35 was steered with a wheel just like a civilian automobile. Its tracks could move independently, allowing it to turn in place. Among its weaknesses, only the platoon commander’s tank had a radio, which operated at a different frequency than the radios of accompanying infantry and artillery. The small turret severely cramped operation of the main gun, but the S35 did have an internal intercom system for the crew. French soldiers perform maintenance on an S35. Tunisia, 1943. The 12th Chasseurs’ tanks never made it to Senegal; the French unloaded them in Algeria instead and sent them by rail to Morocco where the crews trained until February 1943 when they moved to Tunisia to join in the fighting. The S35 company saw action at Gafsa and Cape Bon, where they fought Panzer IV’s of 21st Panzer Division. That action showed the S35 to have been passed by and no longer a first-line battle tank, as the long-barreled 75mm guns of the German tanks shredded the first S35’s to appear, sending the rest into rapid retreat. After the Axis surrender, the 12th Chasseurs turned in their S35’s, which were handed over to the military police, and took over new American-made Shermans – after each crew welded the nameplate of their old S35 to their new tank. They became part of the famous French 2nd Armored Division and later fought in Europe with their new tanks. Next time, we’ll look at the French armored cars. There are more of them in La Campagne de Tunisie than you’d think.